The unseasonably sunny weather has created shooting stars out of our cauliflower wanting to bloom, but our garden’s real star of the week is undoubtably the purple cauliflower. This handsome vegetable has grown from seed originating in Sicily, and its ancestors are the same forms of cauliflower from which the common crisp white cauliflower has been derived, modified by the French in the 16th Century. The purple colouring is caused by the presence of the antioxidant group anthocyanins, which can also be found in red cabbage and red wine. 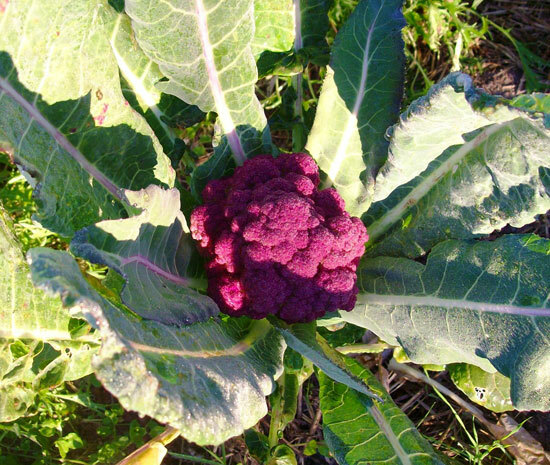 In case you’d also like to grow a beautiful purple Sicilian Cauliflower or two, you can get seeds from Shannon at the Gravel Garden in Somerset West (Call 082 7332834).